Ottis Gibson and his troops in general reached the objectives that they set themselves, but you still get the feeling there’s some depth issues. There are two ways to look at the Proteas’ year in 2018. If Test cricket was the focus, Ottis Gibson and his men could reflect that they accomplished their main objective: winning two high-profile series against India and Australia at home. Both battles were highly compelling, with the one against Virat Kohli and his troops feeling particularly a tad lucky at times given how fine the margins generally were. Beating the Aussies 3-1 was far more impressive, though there was a certain scandal that eventually took the sting out of that series (more on that later). July’s series against Sri Lanka was pretty forgettable given that the batsmen still remain pretty clueless in dealing with top-class spin, but in many ways that trip was meaningless. With the 2019 World Cup in the UK looming, ODI cricket was arguably far more relevant this year. And South Africa’s results were distinctly mixed in that regard. A comprehensive 5-1 series loss to India at home was truly traumatic, particularly how the Indian spinners decimated the hosts’ batting, which was compromised by injuries to Faf du Plessis and AB de Villiers. The Proteas did well to win an ODI series in Sri Lanka 3-2, which was highlighted by how well a young bowling attack performed. A low-profile series against Zimbabwe was punctuated by some pretty ordinary batting before Dale Steyn added the missing ingredient to the bowling attack in helping South Africa clinch the series in Oz. It represented a decidedly lighter end to a 50-overs year that started very gloomily. Almost exactly two years after Kagiso Rabada announced himself as hot property with 13 wickets in a Test against England, Centurion once again proved the setting for another black fast bowler to emerge. 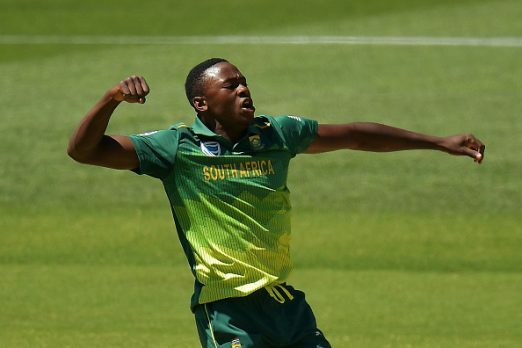 Lungi Ngidi had the big task of filling Dale Steyn’s void for the second Test against India. He was hardly overawed on his debut, memorably taking 6/39 in the second innings and going from strength to strength. Given how he was back to his best, especially in the Test series against Australia, the unexpected international retirement of AB de Villiers came as a massive shock. Fans and observers had legitimately looked forward to him giving the highest level once more cracking crack and spearheading the drive towards an elusive World Cup title. At least he gave the national selectors relatively enough time to test depth in his place. Well, that one’s pretty easy. For weeks, “Sandpapergate” dominated discourse in world cricket as Australia’s leadership core of Steve Smith and David Warner were infamously suspended for one year after admitting to being complicit in ball-tampering. While the South African cricket public generally had feelings of schadenfreude on the matter, they didn’t cover themselves in glory during that series, especially in light of the whole Sonny Bill Williams and David Warner drama. Kagiso Rabada required Dali Mpofu’s magic touch to overturn a series-ending suspension and Quinton de Kock picked a fight with Warner on the Kingsmead stairs. Yet nothing could top the event that changed Aussie cricket profoundly. He received considerably more support than in previous years, but that merely illustrates what a world class bowler Kagiso Rabada has become. He might not steal the headlines so much anymore, yet he’s unequivocally the leader of the Proteas attack. Rabada won’t be particularly proud of this clear mishap, but the Aussie commentary is pretty classic. What on earth happened here, Kagiso Rabada? ??????????? ?